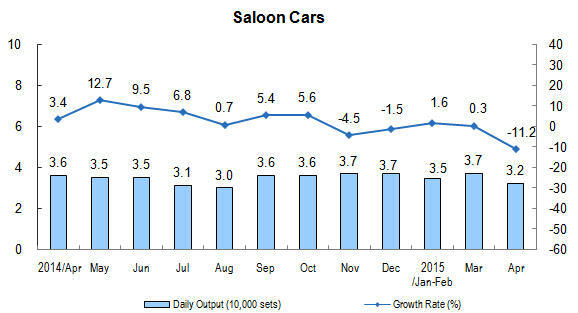 In April 2015, the total value added of the industrial enterprises above designated size was up by 5.9 percent year-on-year in real terms (the following growth rates of value added are real growth rates, after deducting price factors), 0.3 percentage points higher than that in the first three months of 2015. 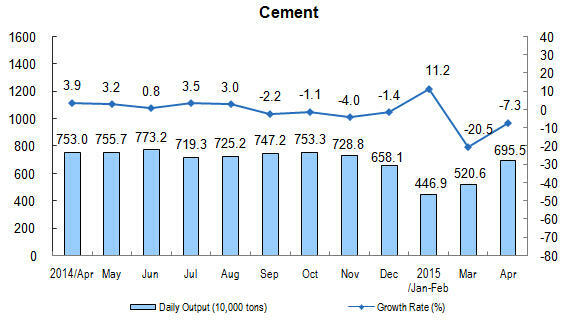 In April, the total value added of the industrial enterprises above designated size went up by 0.57 percent month-on-month. 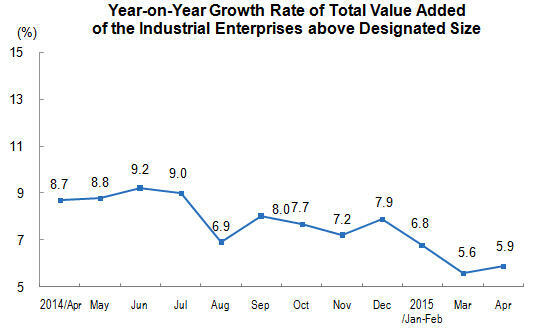 In the first four months of 2015, the total value added of the industrial enterprises above designated size was up by 6.2 percent year-on-year. 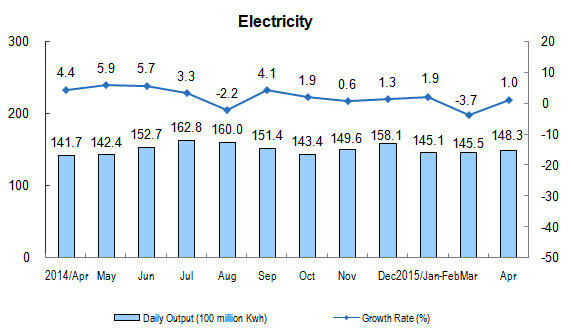 In view of three sectors, the value added of mining and quarrying increased 2.5 percent in April, that of manufacturing increased 6.5 percent, and that of production and distribution of electricity, gas and water was down by 2.0 percent, year-on-year. Analysis on different types of enterprises showed that, in April, the year-on-year growth of the state holding enterprises increased 1.9 percent, collective enterprises increased 0.4 percent, joint-stock enterprises increased 7.4 percent, enterprises funded by foreign investors or investors from Hong Kong, Macao and Taiwan province increased 2.9 percent. 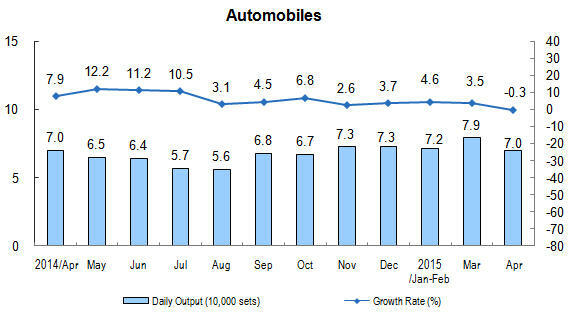 Grouped by different sectors, in April, 38 industries within 41 industrial divisions kept year-on-year growth. 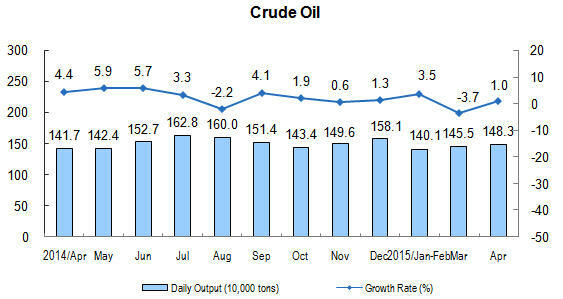 Of this total, the growth of processing of food from agricultural products was 2.3 percent; the textile industry was up by 6.6 percent; the manufacture of raw chemical materials and chemical products, up by 10.6 percent; the manufacture of non-metallic mineral products, up by 4.2 percent; the manufacture and processing of ferrous metals, up by 6.1 percent; the manufacture and processing of non-ferrous metals, up by 8.2 percent; the manufacture of general-purpose machinery, up by 2.6 percent; the manufacture of special-purpose machinery, up by 2.4 percent; the manufacture of automobile industry, up by 5.0 percent; the manufacture of railway locomotives, building of ships and boats, manufacture of air and spacecrafts and other transportation equipments, up by 9.2 percent; the manufacture of electric machinery and equipment, up by 6.5 percent; the manufacture of computer, communication equipment and other electronic equipment, up by 10.2 percent; the production and supply of electricity and heat, up by 0.7 percent. In terms of different regions, in April, the value-added of eastern region increased 6.5 percent year-on-year; the central region went up by 6.5 percent; western region rose by 7.3 percent; northeast region decreased 4.2 percent. 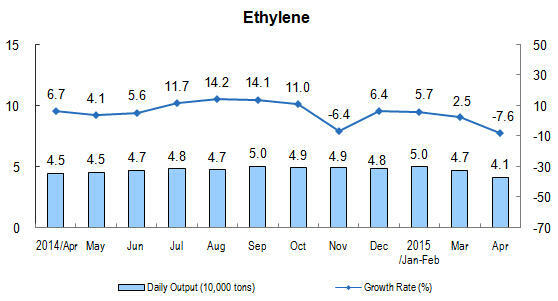 In terms of different products, 290 products within 565 products kept year-on-year growth. 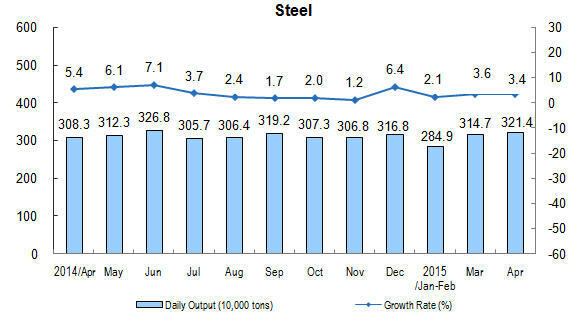 Of this total, the output of pig iron was 96.41 million tons, went up by 3.4 percent year-on-year; that of cement was 208.65 million tons, down by 7.3 percent; that of 10 kinds of nonferrous metals was 4.17 million tons, up by 9.7 percent; that of ethylene was 1230 thousand tons, down by 7.6 percent; that of automobiles was 2096 thousand sets, down by 0.3 percent; that of cars was 966 thousand sets, down by 11.2 percent; that of coal was 298.02million tons, down by 7.4 percent; that of electricity was 445.0 billion kilowatt-hours, up by 1.0 percent; that of crude oil was 43.13 million tons, up by 6.9 percent. The sales ratio of industrial products in April was 97.7 percent, 0.2 percentage points higher over the same period of last year. The total export delivery value of industrial enterprises was 932.3 billion yuan, a nominal year-on-year decrease of 2.9 percent. 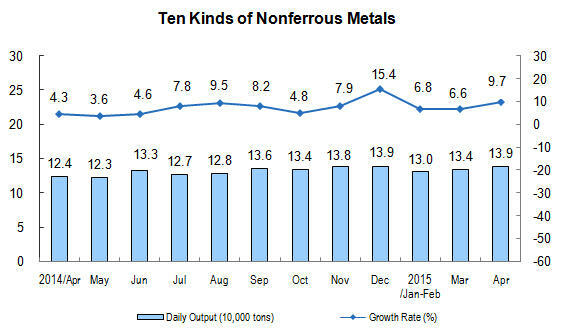 According to the revision on the historical production data of 10 kinds of nonferrous metals, automobiles and cars, the average daily production data of 10 kinds of nonferrous metals, automobiles and cars from April 2014 to February 2015 was revised respectively.